Jyo-Saya (sheath) for Western Utility - Fruit Knife - 120mm/4-3/4 in. 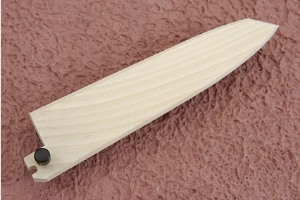 Product Description for Jyo-Saya (sheath) for Western Utility - Fruit Knife - 120mm/4-3/4 in. Description: Saya (traditional Japanese wooden sheaths) protect a knife's edge when stored in a drawer or knife roll. This saya is designed to fit 120mm (4-3/4 inch) utility knives with Western style handles. Because all knives are made slightly different sizes, this saya will not fit all 120mm petty knives. If ordered with a knife, we will verify a perfect fit prior to shipping. If ordered separately, the saya may need to be modified to perfectly fit the knife. This jyo-saya is designed for utility knives that measure approximately 5 inches from tip to bolster, a blade height of 1.05 inches, and a blade width of .09 inches.